A growing energy source in the U.S., wind power uses towers up to 300 feet tall typically equipped with three blades with wingspans double that of a Boeing 747. At their tips, the blades are moving close to 200 miles per hour. Wind power is generally regarded as a green energy source, but one key concern about its development is its impact on wildlife like bats and birds – particularly bald and golden eagles, animals protected under federal law. Researchers from Oregon State University are working to make eagles less likely to collide with turbine blades without affecting turbine operations, thus making wind energy more wildlife friendly. 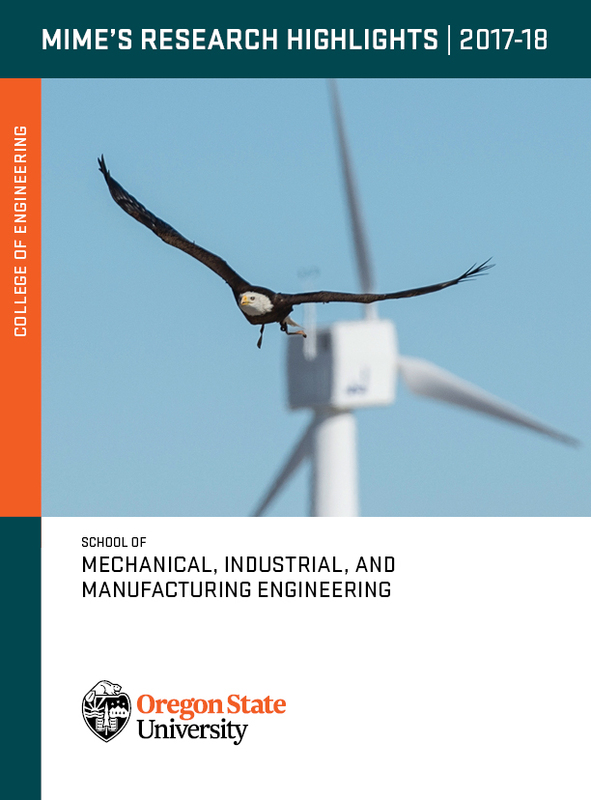 Last year, the U.S. Department of Energy’s Office of Energy Efficiency and Renewable Energy awarded Roberto Albertani, Boeing Professor of Mechanical Engineering at Oregon State University, a $625,000 grant to develop technology for detecting and deterring approaching eagles and for determining if a blade strike has occurred. This research is part of the Energy Department’s efforts to enable wind power deployment and ensure coexistence with wildlife by addressing siting and environmental issues. Albertani’s team is developing a three-part system for protecting the eagles. “We’re one of the leading teams in the world doing this kind of work,” said Albertani. The team includes Sinisa Todorovic, associate professor of computer science, Matthew Johnston, assistant professor of electrical and computer engineering, and three Oregon State graduate students, as well two collaborators from the U.S. Geological Survey, biological statistician Manuela Huso and wildlife biologist and eagle expert Todd Katzner. 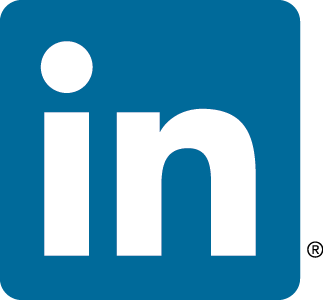 An external advisory board includes wind energy manufacturers and developers. If successful, Albertani said, the system that he and his colleagues develop will be a major breakthrough in a safer-for-wildlife expansion of wind energy worldwide. 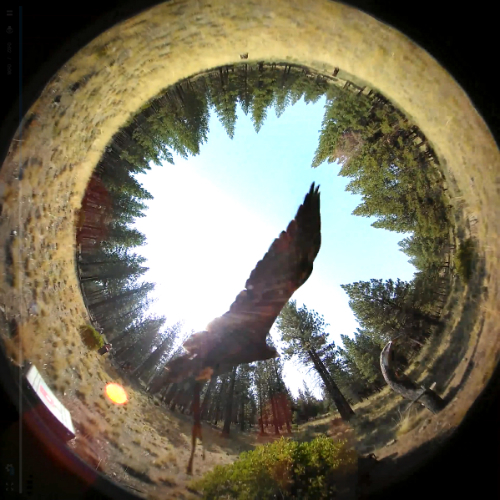 The view of an eagle's flight caught by a 360-degree camera. Cameras like this one will be mounted on wind turbines as part of a system to detect and deter eagles flying by. The system features a tower-mounted, computer-connected camera able to determine if an approaching bird is an eagle and whether it’s flying toward the blades. If both those answers are yes, the computer triggers a ground-level deterrent: randomly moving, brightly colored facsimiles of people—designed to play into eagles’ apparent aversion to humans. At the root of each turbine-blade will be vibration sensors able to detect the kind of thump produced by a blade hitting an object. Whenever such a thump is detected, recorded video data from a blade-mounted micro-camera will be examined to determine the cause of the event and the animal species involved. The system will be also able to estimate the blade position at the time of the event, a critically important piece of information for biological studies. “If we strike a generic bird, sad as that is, it’s not as critical as striking a protected golden eagle, which would potentially cause restrictions to wind farm operations and new construction with big losses in revenue, and, most important, the loss of a member of a protected species,” Albertani said. Primary field testing is taking place at the National Renewable Energy Laboratory’s National Wind Technology Center in Boulder, Colorado and at the North American Wind Research and Training Center and Community College in Tucumcari, New Mexico. Additional field work with trained and wild eagles is also being done in locations in Oregon including at the High Desert Museum in Bend, Oregon.